Thread: lw on linux... screenshot! wow! this is front page at winehq! it is both cool and lame. Technically speaking, to which I can't, what is 'wrong' with WINE? By wrong I mean what challenges do they face? It seems that almost everything almost works. Am I the only one who's seeing LW version 5.5 on there? they have a hard enough time keeping up with mac. i wouldn't hold my breath. also, yeah, it's 5.5... that's why i said that the image is both cool and really really lame. 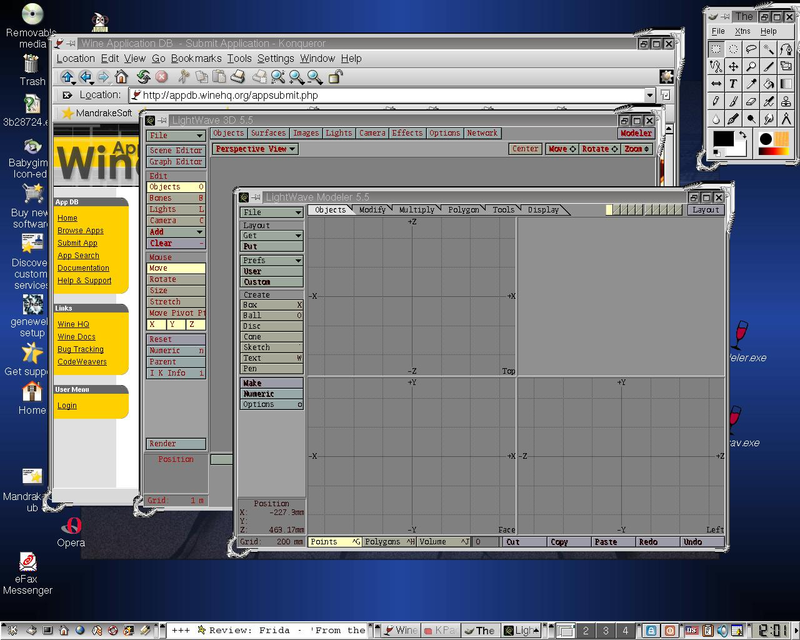 Here was my linux test of lightwave running under virtual box. The actual version of lw don't run with wine. For the moment lw is a windows programs and most plugins run in windows and some plugins run on mac too. Yeah, I didn't even consider holding my breath for IES lights and drive-cached radiosity, and look what they've done to us! As wise men once said: Nobody expects the Spanish Inquisition! so by that you're saying that you are expecting a linux version some time soon? The problems is not LW for Linux, it's the fact that LW is plugin based, and getting years of plugins for Mac is hard enough, trying to add a third Linux platform is hard to justify. However Wine support would have to be at least a thought for NT. And Jarno has mentioned that NT are aware of the desire from the LW community for Linux. So perhaps it not just a pipe dream for the current time...... The dongle is the real thorn in the side, NT should at least be looking to get driver support from Sentinal/Rainbow drivers. I wouldn't dare to exactly define how soon is soon, but generally - yes, why not? Oh, DAMN the 5 minute edit rule! Just imagine I edited the above post and inserted a lot of extremely smart and positive comments regarding LW on Linux, and now I'm bothered to write it all again... eh. Please NO! Go wash your mouth with soap! The dongle is a great concept. I move between several different computers and dongles let me do that. I realy hate it that zBrush doesn't have a dongle, now I only can install it on two computers and if I want to switch to another I have to deactivate the licence and reactivate it on another computer, what a hassle, and quite impossible if you don't have an internet connection at hand. Totally agree on the dongle issue. These days, you can find fast computers anywhere and if you got your dongle and your LW-on-a-USB-stick you can have a personal LW environment anywhere in a matter of minutes! Except if your dongle dies and you have plugins locked to it. Plugins which are no longer supported because the vendor folded its tent and went away. That really, really hurts. The dongle is also problematic because it is complex - it can get corrupted relatively easily (compared to a USB ethernet dongle combined with FlexLM). The dongle system is also not truly portable. Try using LW on a Windows machine without the dongle drivers, and where you are not admin. You'll have to live with discovery mode because LW cannot see the dongle without the drivers. You need admin rights to be able to install the drivers, or actually even run the LW installer. That's truly, hideously awful. In a corporate environment, this means that the user has to request local admin rights for every machine on which they might want to run LW. They can then install the dongle drivers and run LW properly. Sadly, it also makes a mockery of centralised IT support and is fraught with problems when a machine falls over (who is to blame? who get to pay for the rebuild? IT won't be held accountable). If there was a network licensing system in place, this wouldn't be a problem. If the dongle was replaced by one that didn't need drivers, this also would be problem free. Both have the possibility of making LW run under Wine without limitation. I have wondered why they have not done this. It would be great to have the dongle combined with an install of LW, all your plugs, and enough room for your content and extra room for renders all on a thumb drive that doubles as a hardware key. 8GB drives are less than $100 now.